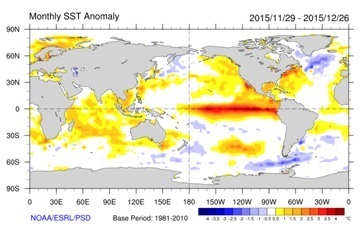 December 2015 will go down in meteorological history as one of the wettest – and warmest – on record. It will also be remembered for the devastating floods in Cumbria, Lancashire, Yorkshire and Scotland. The extensive flooding of homes and businesses, loss of electrical power, major damage to roads and bridges, and disruption to the rail network have caused great misery and incurred huge losses. In this blog our Chief Scientist, Professor Dame Julia Slingo, discusses what factors may have influenced the record breaking weather we have seen in recent weeks. As with all high-impact weather, the meteorological set-up was critical in defining the severity of these events. Throughout the month, the winds have come from the south or southwest, bringing both extreme warmth but also very high levels of moisture. There has been a lot of debate whether this has been associated with El Nino – an intermittent warming of the equatorial Pacific Ocean which has been very strong this year – or whether this is a sign of a changing climate. The links to El Nino are certainly very clear in the set up of large waves (troughs and ridges) in the atmospheric circulation, which we expect to see in these events. However, it does seem that this year the unusual warmth of the North East Pacific Ocean may have altered the position of these waves across North America and into the Atlantic sector, setting up the conditions for the devastating tornadoes in the US and for the southerly feed of moisture-laden air into the UK. Circulation anomalies in the middle troposphere for 1-30 and 24-30 December, showing a persistent pattern of troughs (blue/purple) and ridges (green/orange) across the US, North Atlantic and into Europe. The trough over the western US set up the conditions for tornadoes along the confluence of cold air from the north with very warm air from the Gulf (see elevated sea temperatures above). The southerly airstream from Spain to the North Pole is established by the gradient between the trough over the North Atlantic and the ridge over Europe. Storm Desmond in early December was associated with a strong west-south-westerly flow around the ridge over the eastern seaboard of the US, reaching far back across the Atlantic, as far as the Caribbean. With ocean temperatures well above normal in the southern part of the North Atlantic (see above) – possibly due to the much weaker than normal hurricane season this year associated with the current El Nino – the air was primed with more moisture than normal. This river of atmospheric moisture fed the storms that formed on a stronger than normal jet stream, and as the air impinged on the mountains of Cumbria, large quantities of rainfall were released. Later in the month the southerly flow intensified, with a high pressure system to the east of the UK over continental Europe providing a block to the normal passage of the westerly jet. With colder than usual ocean temperatures over the northern part of the North Atlantic (see above), a strong temperature gradient formed which acted to strengthen the jet and set up the conditions for the formation of rapidly deepening cyclones, such as Storm Frank. These cyclones drew in warm, moist air from far south leading again to heavy rainfall and further flooding on already saturated ground. And the southerly winds on the eastern flank of Storm Frank, and strengthened by the high pressure to the east, enabled extremely warm air to penetrate, temporarily, the deep Arctic leading to very high temperatures. The potential for December to be stormy and wet was picked up in the three-month outlook and is consistent with what we expect in early winter when there is a strong El Nino in place. However, early analysis suggests that the specific nature of this December’s extreme weather might be linked to the detailed structure of this El Nino, to the warmth of the north-east Pacific Ocean and to their combined effects on the atmospheric circulation. As for whether climate change has played a role, we know that the overall warming of the oceans increases the moisture content of the atmosphere by around 6% for every 1°C warming. This extra moisture provides additional energy to the developing weather system, enabling even more moisture to be drawn in to the system, so that the overall enhancement of rainfall when the moisture-laden air impinges on the mountains of Wales, northern England and Scotland may be even more significant. So from basic physical understanding of weather systems it is entirely plausible that climate change has exacerbated what has been a period of very wet and stormy weather arising from natural variability. This entry was posted in Met Office News and tagged Atlantic, climate change, El Nino, heavy rain, Met Office, Storm, Storm Desmond, Storm Eva, Storm Frank, storms, tropical Pacific Ocean, wind. Bookmark the permalink. 20 Responses to What’s been happening to our weather? I agree entirely with the UK having the mildest December on record especially in the south. I certainly agree that it has been the wettest in certain regions, especially Snowdonia, NW England and W Scotland. But it’s a bit like the Curate’s egg extremely wet in some places, and no worse than average in many other places further east and south. Capel Curig may had over 1000 mm of rain for example, but Shawbury has only had 79 mm, likewise Manston has had just 42 mm, Benson 46 mm and Lossiemouth 66 mm. As regards storms in December – well storms and December go together like a horse and carriage – and you’re onto a winner when forecasting that one, especially when the Met Office set the rules for what constitutes a storm – it’s a bit like the police investigating themselves. All the named storms from A to F have just brushed across the northwest of the British Isles, and in mine and a lot of other people’s eyes, although they brought severe gales to exposed coastal regions in the north and west they were nothing out of the usual for this time of the year. So, my end of year report on the Met Office would be 6 out of 10 on those three topics. The unreliable Sky News spent much too much time misinforming viewers that the expected and then actual widespread Boxing Day-Sunday flooding in northern England would be from ‘Storm Eva’ (which brought high winds on Christmas Eve and then departed the UK). 1 out of 10 for that. I suppose if the naming also included winter ‘rainstorms’ Sky MIGHT have performed better. Can you give any references showing that El Nino is associated with increased storminess in Europe in early winter? The references I’ve found indicate that it is associated with a more negative NAO index, which I thought would correspond to there being less storminess and more blocking (though the statistical robustness of any effect of El Nino on the UK also seems to be in doubt). So climate change is to blame for the floods according to Slingo. Just a few short years ago we all being regaled by tales of never ending droughts by the Met Office and BBC. The reservoirs were never again going to fill and we were all going to die. craigm/jbenton: your sources, quoting ‘endless droughts’? Do give us the links! The MO, when talking about climate change impacts, consistently point to increased risk of unusual / extreme events, be they dry or wet. Climate change amplifies existing risk; there’s always been the potential for drought or flood, but a warmer world means for extreme events we should expect greater frequency, shorter odds, reduced return periods etc etc. Try the UK climate risk assessment for an evidence-based, nuanced overview of this. xmetman: just to clarify on your question about ‘storms’ – are you saying that the windspeed is not unusual (rather than the rain)? Yes the wind speed are not untypical of any winter across the British Isles. The orographic rainfall totals over Snowdonia and the Lake District are unprecedented in the rainfall records we have. Don’t forget that now we now have rainfall gauges in isolated elevated locations that we have never had them before so we should be cautious on records that have begun only recently. My argument is about semantics and the exact definition of what constitutes a ‘storm’. As far as I’m concerned storm Frank did not affect the British isles very much at all but it did impact Iceland. The trailing frontal structure (not a storm although it did tighten the gradient) that storm Frank pushed across the British Isles, did produce a lot of rain, but by that time storm Frank had long gone. Obviously I have few supporters in my quest to leave the original definition of storm well alone, and storms now seem to have become a weekly occurrence in these climes. Storms have now become just another buzz word to adorn a tweet, blog or newspaper headline with, to hell with the increased frequency that they are now occurring, or that at one time of day, that they only happened once in a decade. To get back to your original question – yes I think storms are about wind speed and not rainfall, but obviously they usually come hand in hand. Please have a look at my blog, I have analysed all the named storms A-F, and have even calculated a storm index for each of them! The name our storms pilot is in no way an attempt to redefine what consitutes a storm – Admiral Beaufort did that admirably in the 1800s. This winters pilot with Met Eireann is inteded to see whether naming storms will help raise awareness of severe weather and ensure greater safety of the public. In the UK, the criteria for naming wind storms is linked to the Met Office National Severe Weather Warning Service which is based on a combination of both the impact that weather may have and the likelihood of those impacts occurring. For the Met Office to name a wind storm it has to have the potential to cause ‘medium’ or ‘high’ impacts in the UK. So that’s in the top right of the National Severe Weather Warnings matrix. Its certainly been windy in my part of the world (Southern England). Looking at the analysis charts for each day of the month, there is rarely a day where the isobars aren’t packed in across the UK. Thats hardly normal. Some windy periods might be expected, but not almost unabated, with barely any calm periods at all. The surprise to me is that given the persistent windiness there weren’t more very strong winds – I suppose most of the storm centres tracked somewhat to the north. I’d be amazed if you could show that an index of UK average wind speed was ‘typical’. The December rainfall totals map was a bit surprising – near normal in the South – as I was expecting above average given how relentlessly poor the weather has been. I think that the number of wet days is well above average despite the totals, however. And my taxes were spent for a scientist to throw around ambiguities like ‘whether’, ‘may’, ‘possibly’, ‘suggests’, ‘might’, ‘entirely plausible’ and so on. Basically you’re just guessing, right? All prediction is based on probability in science, therefore that is the language all scientists use. Nothing is proven in science, just improved. In the past you’d have paid the church to tell you that the rains are the fault of your wickedness. Scientific understanding of how the these events come about is still emerging, but thats the point, it will get better, if you give it the chance. I know which system I prefer! The King collects tax from the same coin he minted, without tax the coin has no worth. Therefore to regret paying tax is to suggest you want all money to be worthless. As has been stated elsewhere (can’t recall where), meteorology is an ‘inexact science’. He was doing his best to answer essentially unanswerable questions. Any storm that gets into Arctic regions to raise the temperature in December cannot be predicted. I think he skipped that one. That is Climate Change and is a singular event out of the otherwise gradual change. Earth doesn’t obey science rules or met office rules. Earth does what ever and we have to play catch up. Science has provided a remarkable understanding of the atmosphere and weather over the last 150 years. It gives us the ability to do things that would be considered witchcraft in earlier times – like predict a gale even before the storm system has formed on the other side of the Atlantic. If it ‘does not obey science rules’, what rule does it obey – magic? No, it certainly does conform to the physics of fluid dynamics, thermodynamics etc. If there is uncertainty in it is not because it is unphysical, its because it can’t be measured it in enough detail or the calculations can’t be done in enough detail. But the system itself is a form of physical clockwork that is, in principle, completely predictable. What happened to the months of freezing temps and snow that the news was on about in Nov ? Scaife was primarily blaming El Nino in the video above. But never mind that if you have an anti-Met Office and anti-AGW agenda.